And—here we go: at last long-suffering long-awaited Google Music went public—the thing I've been eagerly waiting for so long! I'd be happy to send my 130 GB of music up in the cloud. I perfectly fit into the free limit of twenty thousand files. The thing is, the platform is now only available in the USA. But as this is only verified during the registration, if you didn't happen to live in that country, a proxy will do the trick. Clouds mean no haste: in one day I've uploaded only a fourth of my treasures. 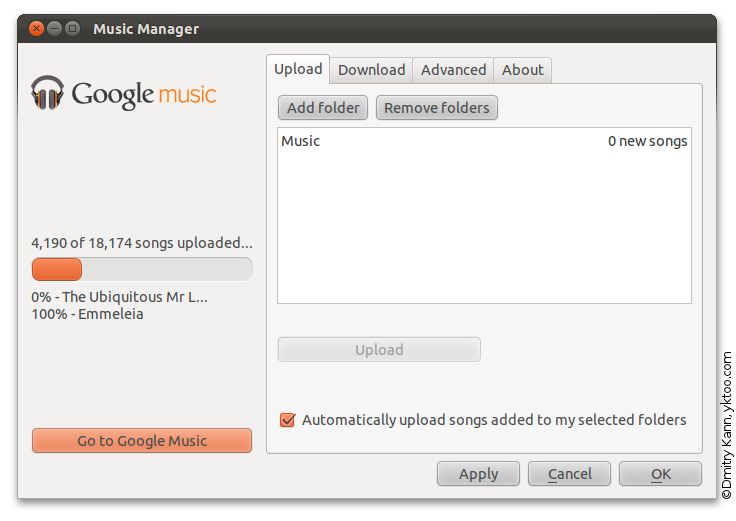 But the mere fact Google have released a Linux version of the Music Manager app is remarkable. Thanks No-Evil Corp.